SambaDá embodies the rich musical traditions of Brazil, with reference to salsa and cumbia, and blending them all together with funk and reggae beats. TICKETS: $20/Advance, $25/Door, Tickets are available online at www.minersfoundry.org, by phone 530-265-5040, or in person at the Miners Foundry Box Office, and in person at Briar Patch Co-Op. Ticketing fees do not apply for purchases made by phone or in person through the Miners Foundry Box Office. 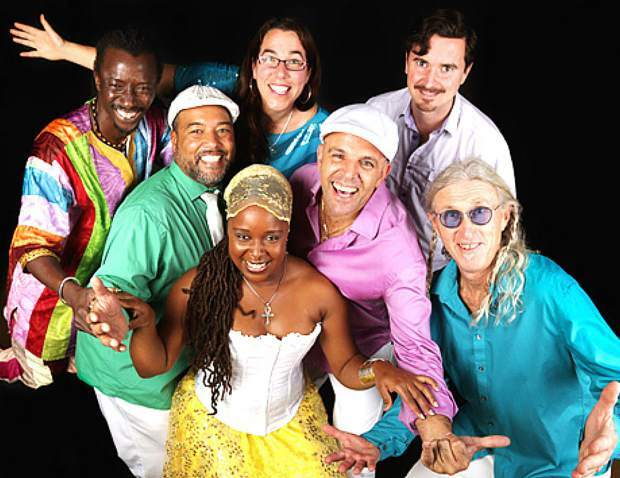 On Thursday, July 19, the Miners Foundry Cultural Center will erupt into an explosion of music, dance and a celebration of world cultures when SambaDá with special guests Kadija take the stage. Known for their high-energy percussion, danceable grooves and visually dynamic show, SambaDá musically unites the Americas. Formed in 1998 in Santa Cruz by capoeira master Papiba Godinho, saxophonist Anne Stafford, and drummer Gary Kehoe, SambaDá has always embodied the rich musical traditions of Brazil, while also referencing salsa and cumbia, to blend them playfully with funk and reggae beats. The result is a unique musical sound with a universal appeal. When singer and dancer Dandha da Hora arrived in Santa Cruz from Salvador, Bahia, Brazil and joined SambaDá in 2005, she brought the power of her Afro-Brazilian cultural heritage to the band. Dandha has been a performing member of the renowned group Ilê Aiyê of Brazil since she was 6 years old. Ilê Aiyê is one of the most beloved and important Afro Blocos from Bahia, Brazil. It is known all over the world for its music and dance performance and its social activism, fighting racism and promoting education, culture and tradition. Honoring Ilê Aiyê’s legacy as well as their own commitment to a more just world, SambaDá works and plays for social justice, peace and the respect of all cultures and peoples. Opening up for SambaDá is the musical duo Kadija, a brand new project featuring musician/producer Aja Salvatore and singer/songwriter Melike Konur. Equal parts funk/soul/jazz heavily inundated with break beats and African rhythms sprinkled with heart opening and soul reaching lyrics. Konur is a self proclaimed Afro-Turk spending the last five years reconnecting to her paternal homeland of Istanbul, Turkey. She aspires to speak lyrically on an enigmatic cultural amalgamation she grew up in. Since making her professional debut at the age of fourteen at the Kennedy Center, Konur has worked with Debbie Allen, Orchestra Italiana del Cinema, members of Incognito, and studied jazz at Point Park Conservatory of the Arts. Her role in the duo is clear as a soulful artist that has privilege to walk in many worlds, but make no mistake; her writing comes from the heart and is to uplift all people. Aja Salvatore is a drummer and guitarist with roots in jazz and an extensive background of studying in Mali, Africa. He was a student of the late renowned guitar master Zani Diabate and djembe grand master Abdul Doumbia. He is also a film producer and spearheaded the film, “Music in Mali: Life is Hard Music is Good,” along with Grammy-award winning sound engineer, Oz Fritz. As an artist Salvatore has worked with Bill Laswell, Toumani Diabate, Cyhi the Prince, Fat Trell, Les Nubians, Earl Chinna Smith and Danny Glover. Frequent guests joining Kadija include Fred Doumbe (Les Nubians), Daniel Moreno (Don Cherry, Salif Keita, Toumani Diabate), Richard Jones (Cherry Royale), Mike Skartezenia (BlocoElectro) and more.